Distanz, 2013. 136 pp., 60 color and black & white illustrations, 8¼x11". The photographic works of Viktoria Binschtok (b. Moscow, 1972; lives and works in Berlin) explore the idea of visibility. The artist uses surprising displacements of context to examine which contents are transmitted within the firmly defined boundaries of the picture and which exceed these boundaries, being a matter of our own knowledge. In addition to her own photographs, Binschtok accordingly avails herself of the Internet as a no less fertile source of visual material. In her most recent series, 'World of Details,' Viktoria Binschtok combines analogue and digital imageries. She begins by selecting New York street scenes from the vast archives of Google Street View, and then travels to these places to take her own picture of the reality she finds there. 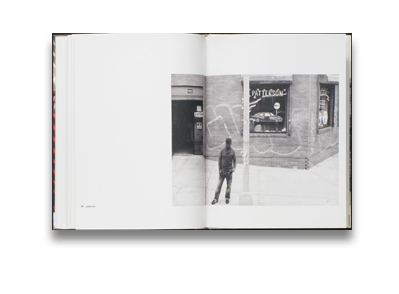 The reference images render streetscapes from a distance; Binschtok, meanwhile, expands on details, counterbalancing the straightforward photographs taken by a programmed automatic apparatus with what ultimately distinguishes man from machine: intention. 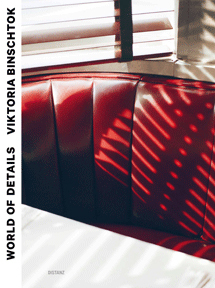 In 'World of Details,' Viktoria Binschtok not only visualizes how we see the world; she also goes beyond documentary photography without relying on the expedients of staging.